‘Melissa McCarthy’, I am sure this name needs no introduction. But still for those who don’t know about her except for her acting skills she is also a comedian, writer, fashion designer, and producer. Her career shot up from the television series Gilmore Girls, for her role as Sookie St. James. Apart from being in the news for her talent, recently she has grabbed everyone’s attention by counting her calories. She has reportedly lost 50 pounds, and she has no plans to stop there. In fact, her thoughts on her weight loss journey are inspiring to women everywhere in the world. In addition to inspiring women to slim down, the Ghostbusters star wants to create a ripple in the fashion industry. According to her, “Women come in all sizes. Seventy percent of women in the United States are a size 14 or above, and that’s technically ‘plus-size,’. So she wants her line to be uncategorized, giving women the ability to shop together without feeling segregated or feeling that they are not worthy. You can see the glow in her slimmed face and the confidence she has in her new line! Her career started with a screening of 50 seconds and now we all know what she is ? And we seriously can’t take our eyes off her from Ghostbusters, an amazing actor. 2. WOW, I just love this particular scene from Charlie’s Angels, I wonder how much efforts she had put on to pace up with Lucy Liu in damn 15 seconds. Do watch it on youtube once. 3. 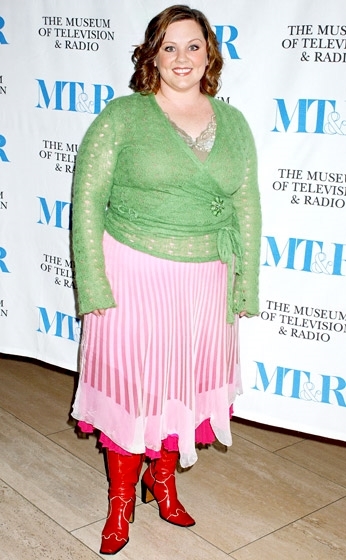 Yoo so here is Sookie St. James from Gilmore Girls, her career shot up from this show and the upward curve never came down since then. 4. Oh! she looks quite sensuous in The Life of David Gale. 5. I know our Girl has become a box office sensation after this movie. But I was shocked to recognize Melissa McCarthy, she lived up to her role of a paramedic in White Oleander. 7. A still from Samantha Who? She looks cute, isn’t she ? 8. Could you say that this Mike & Molly star is 44-year-old? Dumbstruck, right? 9. From 2010 – 2013 she has been starred in many big hits like, Bridesmaids, Identity Thief, and The Heat. 10. I’ve watched almost all of Melissa’s movies but, this one my favorite, and I can still watch 100 times. 11. With her sparkling and bright career, she definitely knows how to dress well for the Red Carpet, and looks no less hot than other actors at this age. 12. Just get set go. Hahaha. She had quite busy years being an actress, screenwriter, and executive producer for Tammy and The Boss. 13. Melissa wanted to create a ripple in the fashion industry so she launched her fashion line called ‘Seven7’. It tailors to plus-sized women. Melissa says she wants to put an end to body shaming plus sized women. 14. Melissa, can I say you look great and looking gorgeous as ever? You can see the glow in her slimmed face and the confidence she has in her new line. Amazing isn’t it? 15. All we can say is we’re lucky to have an influence like Melissa, giving us the pee-your-pants kind of laughter and a positive outlook on body confidence.